They were coined as "acts of collective indiscipline". Various units with very good fighting records had come back from the blazing front in a state of moral disintegration towards the end of April. On 29th April the first mutiny was reported by the 2nd Battalion of the 16th Infantry Regiment. They had been reduced from a nominal 600 men to only 200 by the morning after the assault, and were marched back to their miserable billets in Soissons where their comfort was generally ignored. So they drifted, unwanted, and with the rumours floating that they would be transferred to a 'quiet' front in Alsace. On 29th April they were ordered back to the front. They refused but after midnight were somehow led back to the front by the Colonel appealing to them 'On behalf of your mates already at the Front'. The Military Police picked out a number of men reputed to be ringleaders, and in short order the majority were sentenced to imprisonment in French Guinea -- a death sentence in that disease-ridden place. Five men were sentenced to be shot, and sentence was carried out on June 12th. Notwithstanding the speed at which this mutiny was suppressed, others immediately followed it, these actions accelerating into May with no end in sight. At this time there were about 1000 battalions in the French Army, and it was eventually thought that at least half of them could not be trusted to go into action, although it was thought they would hold the trenches--but no more. In my personal opinion these "acts of collective indiscipline" were brought about by the many broken promises to the troops, bad battle management leading to frightening losses amongst the infantry ever since 1914, and senior staff incomprehension of the living conditions of the French private soldier (the Poilu) or of their need for comfort when in rest and out of the line. Nivelle was acrimoniously fired after accusing his senior army commanders of mismanagement despite their advising him previously of their fears for the campaign. He was replaced in May by General Petain who then had the terrible job of restoring hope and morale to the ailing French army. He did this brilliantly and managed to restore an element of trust in the average Poilu, due to his long association with the fighting men. He introduced proper leave rosters, proper rest camps, proper food facilities, allowed junior officers to report up the chain of command so that their (junior) voices could be heard, and allowed the Colonels of the Regiments to carry out such sentences against known mutineers as they deemed necessary. Later that year, he actually managed to launch various 'set piece' attacks, notably to extend the French lines away from Verdun in the summer and to clear Fort Malmaison at the west end of the Chemin des Dames in October. He accepted that the French army was in no mood to launch any more large-scale assaults but knew that the men would "hold the line" to the best of their ability. Haig was not told of the actual problem but, trusting Petain, continued with the Battle of Arras into May to try to keep some German pressure off the French. 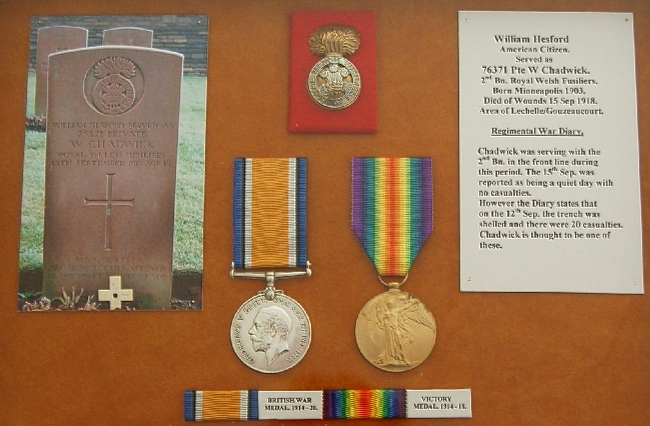 He was successful but at the cost of a heavier daily casualty rate than the army had suffered on the Somme, and the battle finally petered out in stalemate in May. The casualties in April and May amounted to some 148,000, a daily rate higher than those of the Somme the previous year. Previously, in April and then in May, the Australians tried to break the Hindenburg line opposite the village of Bullecourt, not far from Arras. Despite absolutely valiant efforts, they were not successful and again suffered heavy casualties. Even today, a walk over this small battlefield shows what a daunting problem they had. The sunken road which was the German front line is still there, as is the (now derelict) railway line that was the Australian start line. In Flanders the British General Plumer commanding 2nd Army was, in the meantime, successfully completing the mining of the Messines Ridge as a forerunner to an attack north of Ypres to break out of the Salient. The Germans sitting on the ridge had an excellent view into the rear of the British positions in the Salient, and this menace had to be removed first. If Haig could then reach Zeebrugge and Bruges he could destroy the U-boat bases and remove the U-boat menace from the incoming convoys to the UK, which were being decimated. 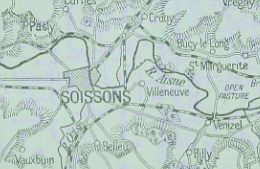 In September 1917 the British Army also experienced some "collective indiscipline" at the Etaples base camp near Boulogne, notorious among the troops for the heavy-handed training methods used there. A display gathered for the Hesford family by our friend, ace researcher and frequent contributor Sidney Clark. William Hesford's family had read about Sidney's discovery of the very young Yank's service in the British Army on the Trip-Wire. Check William's age at his death. 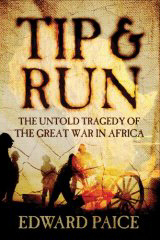 British author Edward Paice has produced a new look at the war in Africa titled Tip & Run: The Untold Tragedy of the Great War in Africa that has received outstanding reviews. If you are not familiar with this topic, Mr. Paice points out the enormous costs incurred by the combatants in this forgotten sector. According to his introduction, "The expense to the British treasury of the of the East African campaign ...was unofficially estimated at more than 700 million pounds (roughly 2.8 billion pounds in today's money)." Further he assesses the "butcher's bill" among "African soldiers and military carriers recruited from East Africa alone exceeded 45,000 -- or one in eight of the country's adult male population...and among all British Imperial combatant and support units who took the field in East African theatre of war the official death toll exceeded 100,000 men...and the true figure may have been as much as double the official tally." And, on page 6 he adds, "More than 100,000 Allied troops and one million military carriers were engaged during the campaign in trying to bring to heel a foe one tenth the[ir] size..."
We asked our frequent contributor Len Shurtleff, who--as you will see--is extremely well versed in African affairs to interview Mr. Paice for our readers. Click here to read the interview. John Monk Saunders received one of the first Academy Awards for his screenplay for Wings (1927).Saunders was born in Hinckley, Minnesota on November 22, 1897. In 1917 he trained at the U.S. School of Military Aeronautics in Berkeley, California. He served as a second lieutenant in the Signal Corps' aviation section during World War I. He graduated from the University of Washington in 1919 and was a Rhodes Scholar at Magdalen College, Oxford. After the war, he lived in Europe before returning to the U.S., where he worked for the Los Angeles Times, the New York Tribune, and American Magazine. He married his second wife, Fay Wray, in 1927. When Saunders wrote the original story for Wings, the first epic of the fliers of World War I, it was Saunders's first major story credit in Hollywood and set him up as one of the men who could "write gutsy, ballsy stories" according to Warner Bros. studio head Jack Warner. Wings was a breakthrough for Saunders. 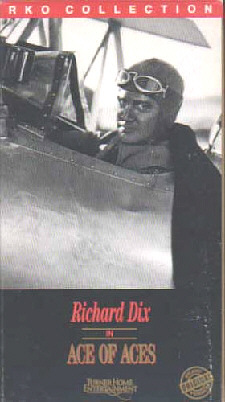 But his most important film credit came in 1930 with an 11-page story, "The Flight Commander." Howard Hawks directed the movie The Dawn Patrol based on the story, and the movie became a classic. Saunders was a full-fledged member of what was called "The Lost Generation" - a glamorous, good-looking young man of refined breeding and excellent education who drank a lot and had a strong self-destructive streak. He had a reputation as a womanizer, and one night Zelda Fitzgerald volunteered to castrate him with a pair of editor's shears! He and Wray finally divorced with William J. "Wild Bill" Donovan of "The Fighting 69th" advising Wray on the separation and divorce. Saunders drifted away from Hollywood and in March 1940 was found hanged in a closet in Fort Myers, Florida. The view of the First World War as a horrific, man-devouring waste spread to movies about aerial combat. The war in the air was seen as harrowing as the war on the ground. Saunders supplied the stories for a number of films in which the air war is no longer filled with gallantry and fearless men. The fliers, constantly facing death, are afraid. Commanders are destroyed by their responsibilities. And everyone drinks to dull the pain. You might think that Saunders's stories could only have been told by someone with firsthand experience in France. But Saunders spent the war in the United States as a flight instructor, and the Armistice came before he was called to Europe. He was at a flying field in Florida as an instructor when he heard the war ended. That night he went to his plane, leaned against the propeller, and cried. Saunders heard a lot of war stories from British, Canadian, and French fliers while at Oxford, as well as from Yanks when he lodged at the American Flying Club in New York upon his return from Europe. The effect of war on a man's character is vividly presented in Ace of Aces (1933), directed by J. Walter Ruben and based on a story, "Bird of Prey," by Saunders. Richard Dix (1893-1949, a WWI army veteran in real life) stars as a Rex "Rocky" Thorne, a pacifist sculptor who enlists when his fiancée Nancy Adams (Elizabeth Allan), an American Red Cross nurse accuses him of cowardice. The air war has a brutalizing effect on the sensitive artist. He is transformed into a bloodthirsty killer. Thorne gets to the point where he takes delight in loading his own machine gun belts, every night, bullet by bullet with murderous glee. "This is a great war, and I'm having a grand time" he says. After shooting down forty German planes, he becomes the "Ace of Aces." He's so ruthless and efficient that his squadron mates dislike him because he "doesn't give the enemy a chance." His fiancée encounters him when he's in Paris for some drinking and whoring. She doesn't like what she sees: the air war she has shamed him into joining has ruined him. He passes up his whoring to coerce her into spending the night with him. What a cad! While recovering from a minor wound Thorne finds himself in a hospital bed next to a young German cadet he shot down. The German has a painful stomach wound, and constantly screams for some forbidden water. The young cadet's hysteria and torment bring home the reality of killing. He eventually silences the wounded man by giving him water and effectively killing him. When Thorne looks at his box of medals he asks himself "Are these worth forty-two dead men? Are they worth one dead man?" When he goes up again, he's too haunted to fight back and is shot down. While Ace of Aces is not a masterpiece, it's entertaining and thought-provoking with a number of interesting touches. When Thorne is initially confronted by his fiancée in his studio he compares the soldiers marching outside his window to lemmings. She marks him with yellow chalk, signifying his cowardice. The pacifism of this and other 1930s war films is honest in depicting the unsettling effect that World War I had on American society. There's an honesty about war and its consequences that's absent from most American war films. Killing is viewed by Saunders as a primitive function, and the pilots in Thorne's squadron have pets that serve as totem animals as if they were tribal warriors. Significantly, Thorne's pet/totem animal is a lion, a killer beast. The other pilots have funny mascots- a pig, a parrot, a chimp, a dog. When Thorne was accused of cowardice by his fiancée, he wiped the yellow chalk signifying cowardice on his clothes. When wounded in his first air battle, Thorne wipes his blood on his clothes signifying his change into a warrior. Aircraft used in Ace of Aces include Waco 7s, Nieuport 28s, a Curtiss Jenny and a LF-1 (J-4 Wright-powered replica). It was filmed in the Trifuno Canyon area, now part of Thousand Oaks, California. Saunders's World War I and aviation-themed screenplays and stories include Wings (1927), Legion of the Condemned (1928), She Goes To War (1929), The Dawn Patrol AKA Flight Commander (1930) The Last Flight (1931), The Eagle and the Hawk (1933), Devil Dogs of the Air (1935), West Point of the Air (1935) and Conquest of the Air (1940). The following are thanked for their contributions to this issue of the Trip-Wire: Donna Cunningham, Frank Jordan, Tony Langley, Christina Holstein, Tony Noyes, Andy Melomet, Kimball Worcester, and Len Shurtleff; the many of you who sent the items for "Gone West"; the Ontario Provincial Archives for the Vimy Ridge painting; and the Gutenberg Project for the Soissons map. Until next month, your editor, Mike Hanlon.